The other day I happened to look at the College Tour. The College tour is a Dutch program in which the host Twan Huys invites famous people to talk about what made them famous and allow the audience(students mostly) to ask them questions. In this particular episode the guest was John Cleese. During this interview someone asked Cleese about his lectures on creativity. Cleese told that he has been fascinated by creativity for a long time and it was his observation that creativity came from the subconscious, for if creativity was something that logic and intelligence brought about, than it would stand to reason that people of logic and intelligence would be the most creative. And that is certainly not always the case(:P). This remark gave me a flash of insight, for I have always been fascinated by stories, specifically stories that are combined with pictures. Now I realize that many of the things that I posted here, such as my first post for the sl scrapbook, fascinate me because of their story like qualities. 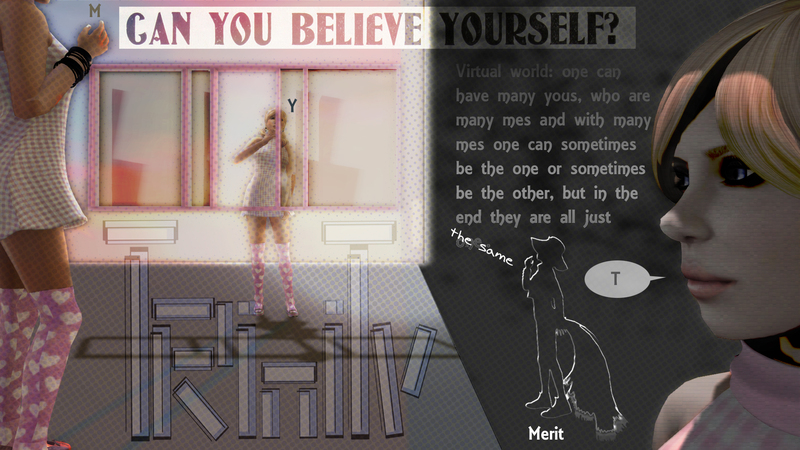 In Second Life you get, if you listen, to hear a lot of stories and some perhaps are as close to the truth as can be possible in a virtual world and others are totally fabricated, sometimes without the teller actually realizing this. One of the things about a place like Second Life is that truth and lies are so mixed up that it is hard to tell where one starts and the other begins. In fact, if you were of a very negative mindset you might say: it is all lies, as it is a make-believe world in which people live make-believe lives and claim make-believe qualities and experiences. Or even: they believe perhaps that which did not happen did happen. The mind can be a great tool for deception! Specifically when it is convenient and the deception is helped along through imagery, sounds, mood, education and social pressure. But perhaps instead of looking at things in terms or lies and truth, one can look at these things as stories, which might be true, but perhaps not. but are mostly aimed at conveying a story instead of a truth of one kind or another. Recently I became interested in the stories that were told in the bible and therefore I borrowed this Bible for the Youth from the library(see below for the source:*) . Next to having pictures, I thought that a bible for youth might be interesting because when you tell something to young people you have to make it pretty engaging and to the point. And this is something the translators have been trying according to their introduction. In addition they claim to provide facts too. Which will be interesting. Let’s have a look at the first part of the bible: the old testament. 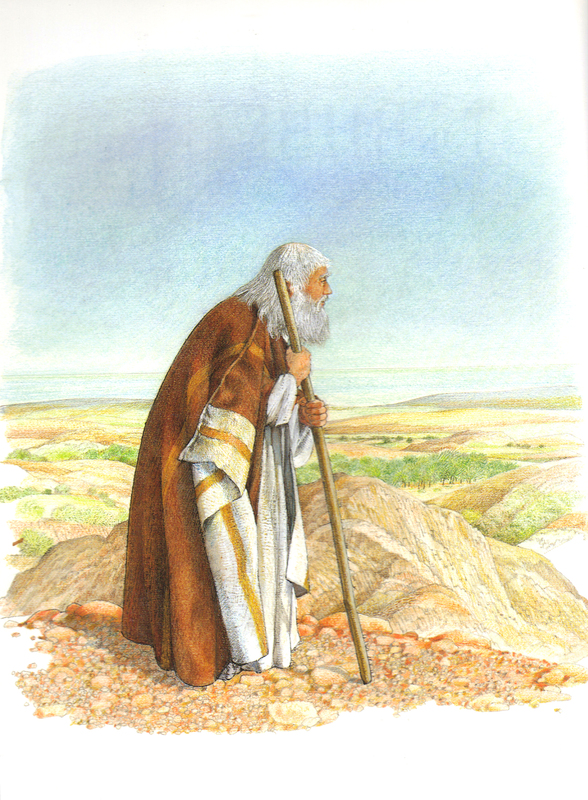 Abraham gets to see the promised land before dying. Above is the first large picture you see in the book and it shows Abraham looking at the promised land before dying. He was called Abram first, but his name was changed to Abraham when Yahweh* decided to make him the founding father of Israel. 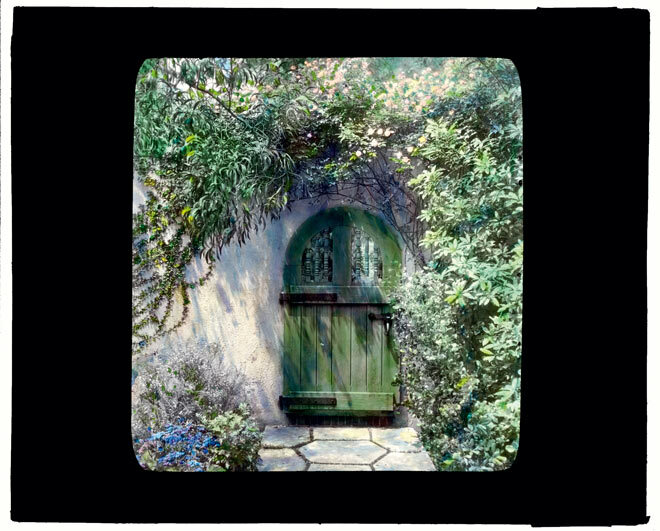 The story itself, to which this picture belongs, is further into the book after the creation stories. 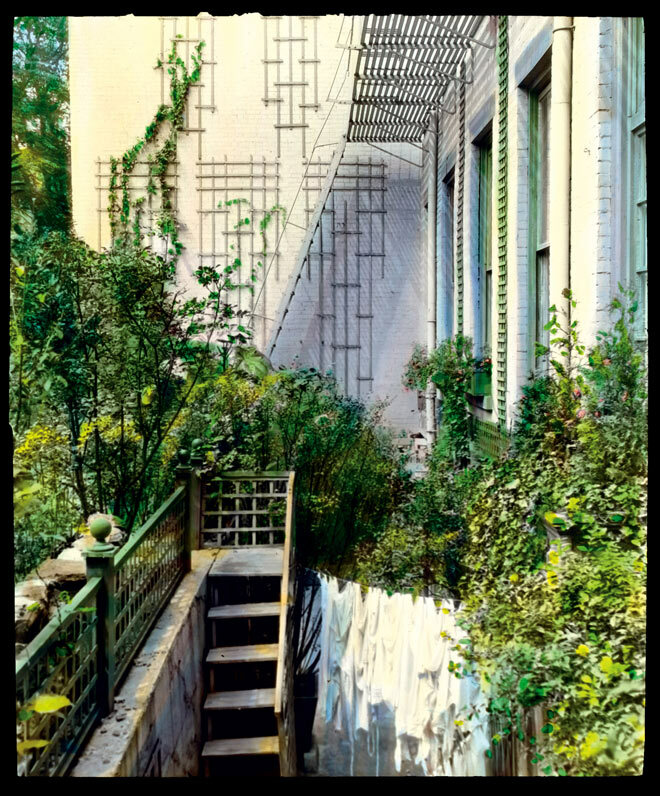 I wanted to show this picture because it is the first big picture in the book. The book is A4 in size and the style of drawing is the one you see above. The bible: a very short introduction. The bible is a collection of writings of different sources spit in two parts. One is called the old testament and has the Jewish people and (the relation to) their god as central themes to unite the writings. The other part is called the new testament and basically tells about Jesus and some of his followers, notably Paul. The two parts are roughly equal in size in this version of the bible, thus Jesus gets as much space as the Jewish tribes and their history. This shows how important Jesus is in the christian faith. While the new testament has a kind of plot structure, the old testament has nothing of the kind. It seems like a loose collection of anecdotes and there is no specific purpose in the story or even a clue or a dramatic moment to work towards. In fact you might think that the old testament would lead inevitably to the new testament, but there is nothing that connects the two because there is a gap of almost four hundreds of years between when the old testament stops and the new testament picks up. The old testament is split in various sections that bundle certain writings. 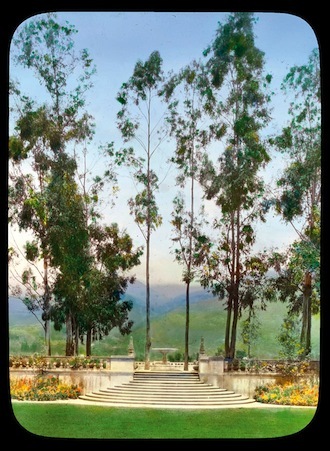 The first part sets up the scene with the creation of the universe, the creation of earth and the creation of mankind. The next part covers the birth of the Jewish people with Abraham/Abram and the move to their homeland, which seems to be called Canaan The next part is mostly about Egypt, how they get to leave Canaan, become slaves and then finally escape their slavery and Egypt. The last part covers the life and times of the Jews in their land including a moment in which they are forced to leave their country. In the first part of this section they are mostly at war with the Philistines, later on the stories mostly tell about confrontations with the various big empires that emerged in the Middle-East such as the Babylonians, Assyrians and the Persians. These were powerful nations against which the Jews stood no chance. What general picture emerges from the Old Testament according to the Bible for the Youth? Some detractors of the bible point out, sometimes with glee, how the bible is full of killing. And it is. This bible of the youth, of which you would expect it to be moderated somewhat, fills the pages with Yahweh or people killing people or planning to kill them. There are other stories full of death and killing, but in the bible this borders on the deranged as it is mentioned in such an off hand way as if killing is a normal reaction to any kind of conflict. Strife between people, notably brothers, often leads to murder or the planning of murder. Kain kills Abel. 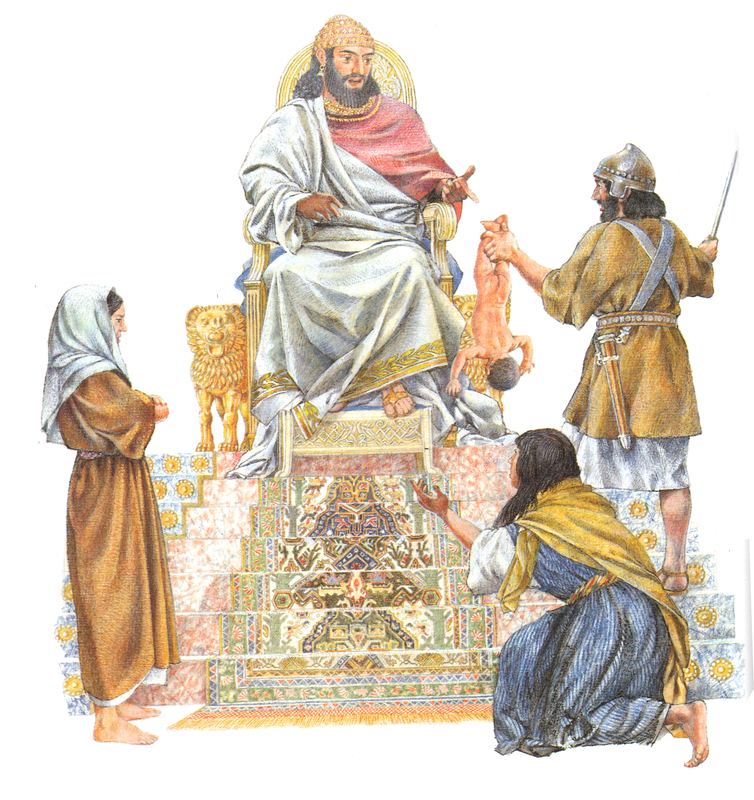 Esau plans to kill Jacob after the latter cheated the first out of his first born child privileges. Twelve brothers plan to kill Josef out of jealousy because he is favored by his father and he narrowly escapes this fate by being sold off. Saul is jealous of David and tries to kill him on several occasions. Whole peoples get slaughtered simply on a the flimsiest of pretexts. The whole earth gets flooded because people sinned. Sodom and Gomorrah get leveled because they sinned. Killing is so normal that after a while I found myself even accepting this reaction. An example is for instance the story of Mozes. At some point it is told that an Egyptian is flogging a Jewish slave..Mozes kills him for it. At various points people get killed because they are at the wrong place at the wrong time. Jephthah promises to offer the first thing he meets when he gets home if he wins in a certain war. And the first thing he meets is his daughter. David lusts after a woman called Bathsheba, her husband is in the way so he is ordered into battle to certain death. Then Yaweh gets angry with David because of this and communicates via Natan that the child he will get with Bathsheba will be killed because of this. And so it happens. (Sidenote: It seems that the bible is even more bloody than this Bible of the Youth, so yes they actually did moderate the bible. An example is the two evil sons of Eli. They get killed for their evilness in the bible. In the Bible for the Youth they are just mentioned to be evil but their deaths is not mentioned). 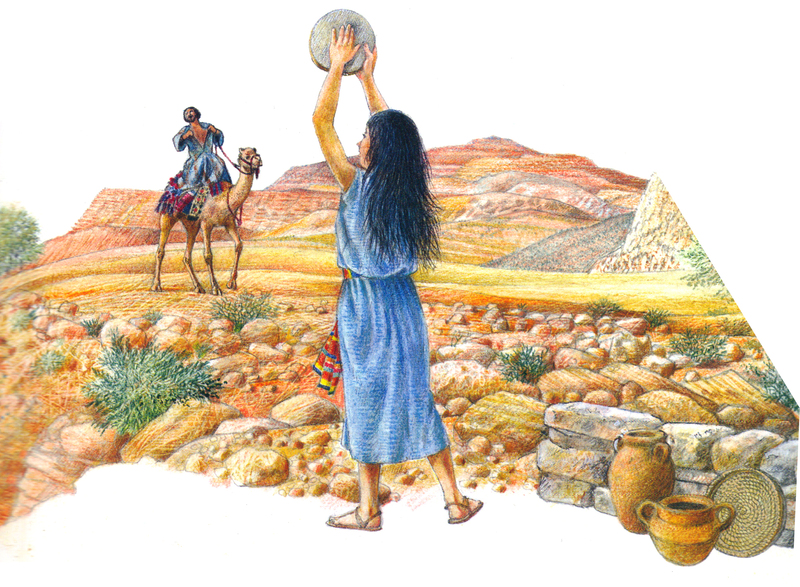 Jephthah promises Yaweh to offer the first thing he meets when he gets home and it happens to be his daughter. The bible is full of stories about strife, punishments and destruction and it pained me to read how little compassion there is for those who get in the way. The earth gets flooded because the people have sinned and there seems to be no way for the sinners to redeem themselves. Sodom and Gomorrah gets destroyed and again there is no option for people to make amends. In fact, in both cases it is not even clear whether the people who were about to be destroyed were aware of their impending fate. This gets even more disconcerting if you think that Yaweh is the god of Israel and seems to be only interested in the tribes of Israel, yet he does drown the world in water killing a lot of people who have never even heard of him..
An example of this lack of compassion is in the Mozes story. When Mozes returns from the mount Sinai, after he received the ten commandments, he finds out that the people made an image of a golden calf to worship. This results in Mozes killing everyone who worships the statue. There is no compassion from either him or Yahweh for these people and although they get a chance to return to god, those who refused to do so were killed. Mozes is not one for tolerance, nor is Yahweh. One thing that surprised me is how often the Jews, Yahweh’s chosen people, turn away from their god. At various moments it is told that the Jews start to worship some other entity and grieve Yahweh by not living according to his commands. An interest aspect of this is what is told about King Josiah: a prophet tells hat Yaweh would have punished the Jews if it was not for their King Josiah who was good man and thus loved by Yaweh and as long as Josiah lives the Jews did not need to fear their god. 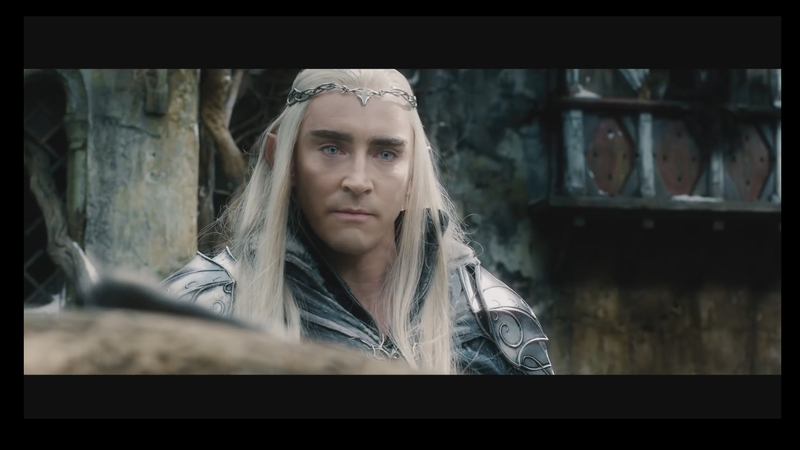 It is interesting in that in many cultures a king is often presented as a go-between a god and their people. It is of course a neat way to strengthen their rule and it still is done today. Coronations are usually also religious ceremonies to underscore that a god approves of the rule and that whomever rebels should fear the wrath of the god as they are of course rebelling against a god approved ruler. A very interesting parallel can be found in the Roman empire in which the various worldly positions are tied in with religious functions. One such function is that of the Pontifex Maximus: the highest priest. The Pontifex Maximus associated the emperor with the god(s) and is therefore one of the pillars on which power of these rulers rested. In fact, insulting the emperor could get you convicted for violating the majesty of the ruler. This usually meant death. Women are not men and thus, with perhaps the exception of Esther , women only function in the context of a male, just like Eve was made for Adam. Even Esther, who gets a book named after her, has only a role to play because she is married to Ahasveros, the King of Kings of Persia and can influence him because she is pretty. The Queen of Sheba appears in the bible only to admire Solomon. The good qualities of women are to be pretty(and young) or rear children(when they get older). Men have friendships, companions and kindred spirits. Men can love their fellow men and most of all they can have a relation with god. Women have almost no relations of any kind with other women with the exception of being sisters or daughters. But these are only of importance because there is a man involved. The only exception seems to be the tale of Noomi and Ruth, but even that tale ends with finding a husband. No woman talks to god directly nor does god ever talk to a woman. Nowhere in the bible of the youth is written that god loves a woman. Women do appear as evil at times. Such as the famous Deliah, who causes Samson’s downfall. If we set aside Yahweh as the inspiration of actions and assume that these are the actions of men -and non other than men – then what picture does emerge from the Bible for the Youth? We get a shocking display of amoral behavior. People trick people(read about how Jacob tricks his near blind father in blessing him to be his successor). People steal other peoples wives(David). People commit suicide(Saul). Men have multiple wives(almost all of them). People make their servants pregnant(Jacob). Kings break the laws the are meant to uphold(Saul).. and so on. One particular dubious story is that of the prophet Elisha. One day he is offered hospitality by a rich woman(without a name, because women do not matter, see above) in a place called Sunem and one day she complains to Elisha that she likes to have a child but that her husband is too old. Well, Elisha predicts that she will deliver a son. And she gets one. One he even saves from death. Probably because it was his son(my interpretation). Elisha predicts that his hostess will get a son within the year. 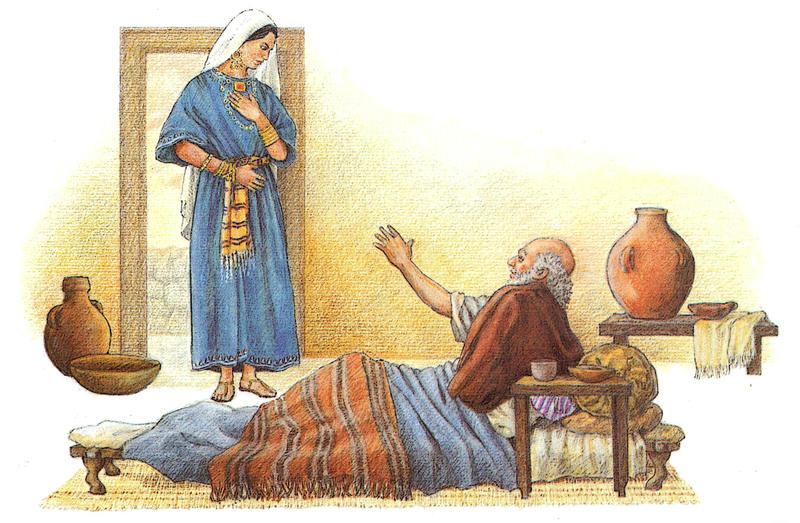 A miracle happens: she does get a son and it dies, but gets resurrected by Elisha. By the way Elisha is also the guy who has a group of kids killed by two bears for mocking his baldness. This is told in the sideline as the tale itself will probably raise to many awkward questions. It is curious that non of the figures that feature in the stories actually display any of the moral qualities that are attributed to them. Successors to kings are often chosen on the ground that Yaweh wants this or that person to succeed or because they are sons. It is seldom that it is said that a person should be king because of their leadership abilities or because they are elected by the people. Sometimes you get a peek at the underlying reality of the story. For instance in the story of Samuel. He is the adoptive son of Eli, a high priest, and Samuel is good and the two sons(unnamed) are evil. It almost feels like we are witnessing some kind of rivalry in which Samuel had to prop up his position as successor to Eli by describing that his two sons were evil and he was good(a man of god). 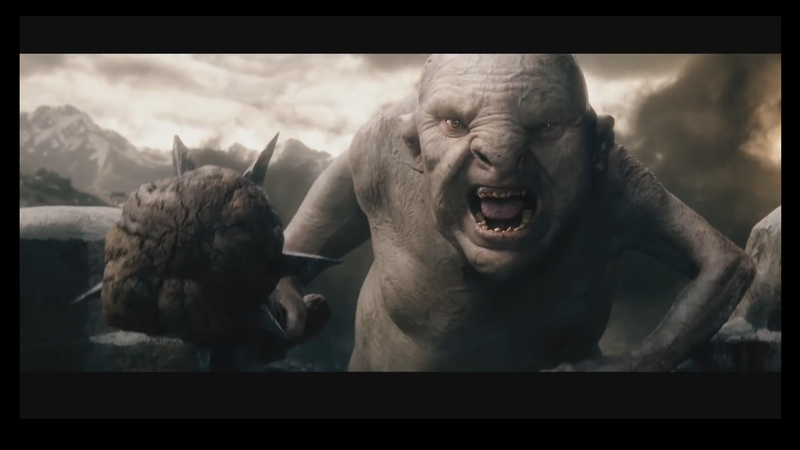 It is probably remains of a fight for supremacy in which the victor’s side of the story is the only story left to us. Even more interesting are all the claims that are unfounded. For instance Solomon is described as being wise and for once in the bible we get a display of a claimed quality. In this bible no quality is otherwise demonstrated or proven. You just have to accept the bible for being true. The sole exception is Solomon. His wisdom is demonstrated by his judgement of two women who claim to be the mother of the same child. To figure this out he threatens to have the kid chopped in half. The argument is that a real mother would not want her child killed while the false mother would settle for half because it would be dead and nobody would get it. And so it happens. And this then is the demonstration of his wisdom. Solomon’s wisdom: threatening to chop a kid in half to find out who the real mother is. So a kid gets hold up by it’s feet and threatened in be cut in half. How more brutal can you be? The whole judgement has nothing to do with wisdom, but with violence and making women out to be retards. And this is then the showcase example of the wisdom of Solomon as given in the Bible for the Youth. Richard Dawkins’ statement is actually not entirely correct. Read on. Reading the old testament as presented in the Bible for the Youth is an awful experience. The blurb on the back of the book promises to give us all the important stories of the bible. I assume this claim to be true. The bible is a cavalcade of unlikable characters and non of them have any redeeming qualities. Most have no personality to speak off, those that do are abject people. I don’t mean people with their strengths and weaknesses, but just abject people. They are nasty, selfish, petty, cheats, dishonest, bloodthirsty killers. Some were obvious confidence tricksters, like the prophets Elijah and Elisha. And this is why Dawkins statement is’t entirely correct. This statement is about Yahweh, but as said before.. if we assume that there is no Yaweh this means that all the acts are done by the people that are in the bible. They are petty, unjust, unforgiving control-freaks; vindictive, bloodthirsty ethnic cleansers; misogynistic, homophobic, racist, infanticidal, genocidal, filicidal, pestilential, megalomaniacal, sadomasochistic, capriciously malevolent bullies. The Old Testament as a great tool for story telling. While the Old Testament is an awful book, it is however a supreme book for story telling. This sounds like a complete reversal of what is said above, but allow me to explain. The Old Testament reads as if someone quickly penned down a series of sketchy plots without filling in the details. It is like a bare-bones framework. As such it can be a great source for developing stories and it should perhaps be read in that fashion. Shakespeare’s plays are full of murder and mayhem and people think his works are among the best that English literature has to offer. The Old Testament itself is a crude storybook, but I can very well imagine how it has been used throughout the ages as a means to tell stories that adapted over time. In this perhaps the Old Testament’s strength is the same as it’s weakness. 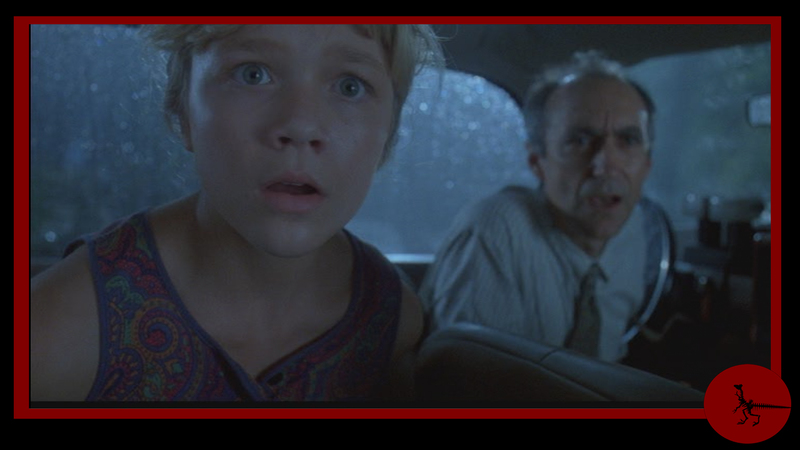 Storytelling: Jurassic Park(part 1/3): god, the devil and lunch! I write reviews, but not because I want to criticize things. Actually I like to learn how to write and tell stories, so that is why I write them. On one level to learn to write the reviews themselves and on another level to analyse the storytelling of that which I am writing about. 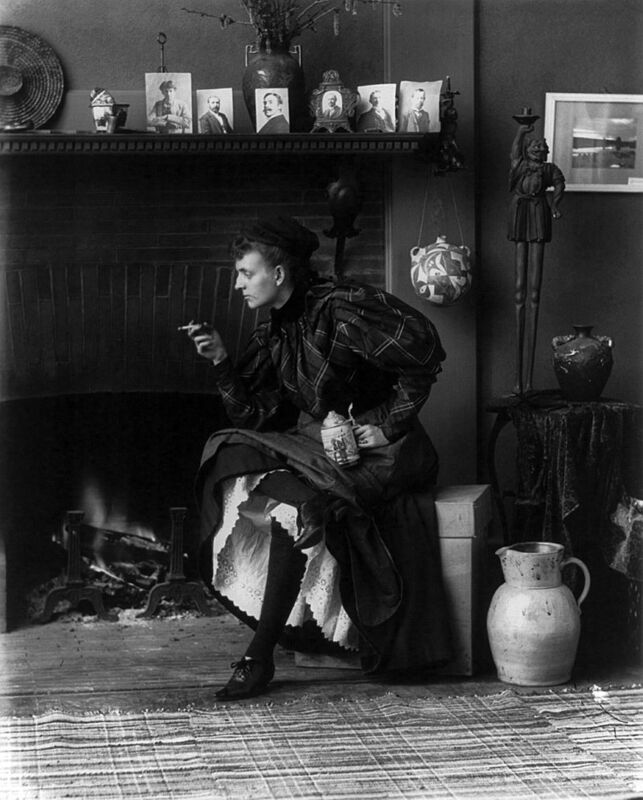 Also I like to look at pictures as part of storytelling. And I like to make pictures. 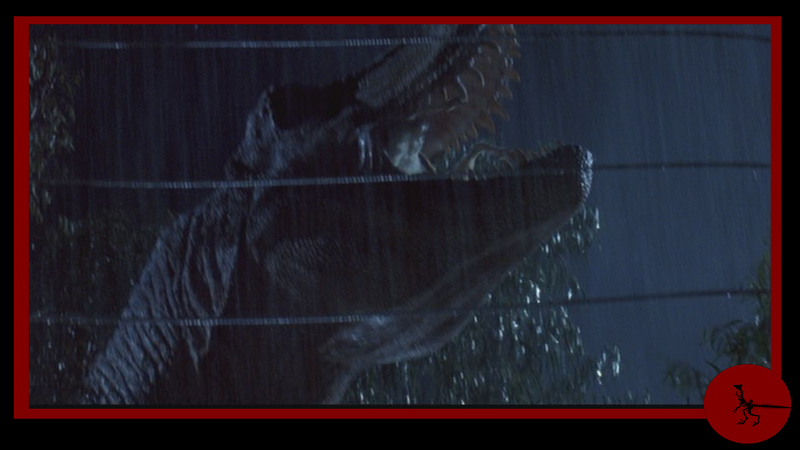 In this post I want to take a look at Jurassic Park, the movie made by Steven Spielberg based on a script written by Michael Crichton, which was an adaption of the book written by Michael Crichton himself. I will focus on the movie and not discuss the book or compare it to the book as I never read the book. 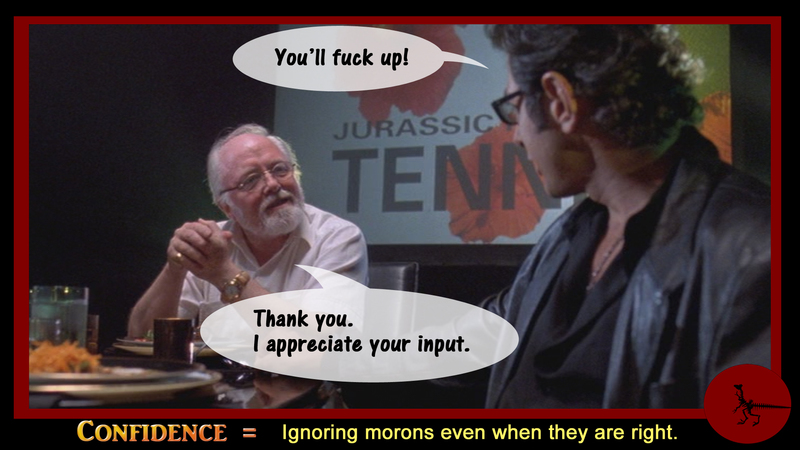 It is also not important to me as I want to write about storytelling in the movie Jurassic Park. 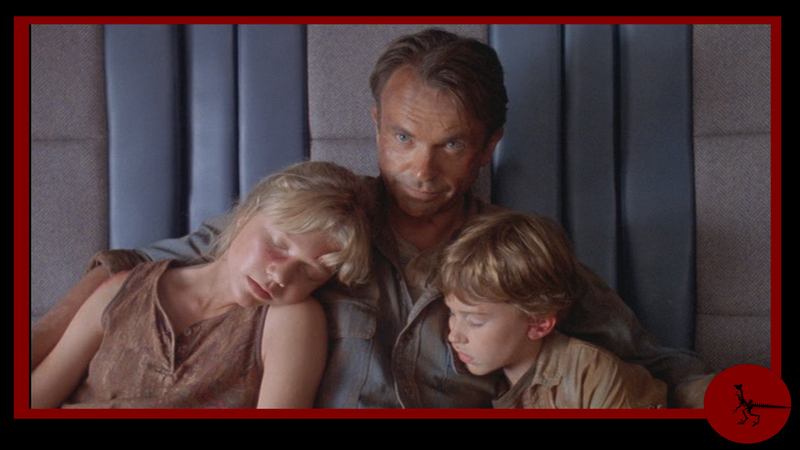 I picked Jurassic Park simply because I just saw it together with my daughters and I think it is a good example of storytelling. It might surprise people that I never have seen the movie before, but there is a simple explanation for it: I live under a rock. Yup, a lot of things escape my notice. 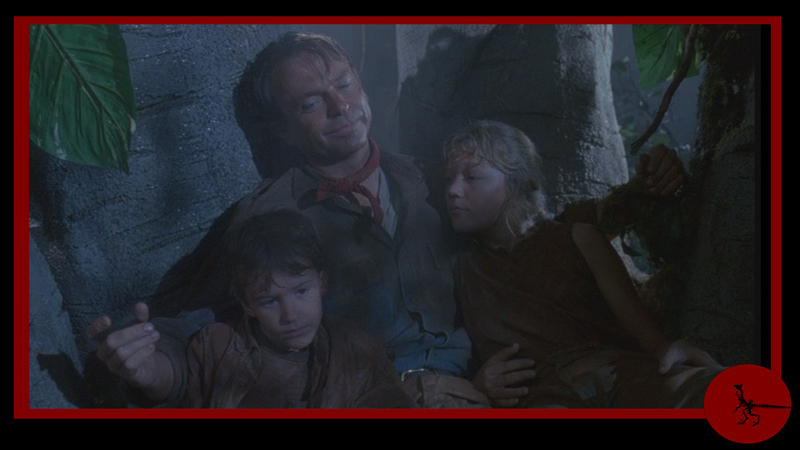 Jurassic Park is a good tale and probably would have been an exceptional tale if it wasn’t for some (very) weak parts. I will try and address those weak parts as we go along so we can consider them and perhaps learn from it. Note that what follows are spoilers as this post is meant to analyse the story and thus will reveal the story and that means: spoilers ahead. Spoilers ahead! 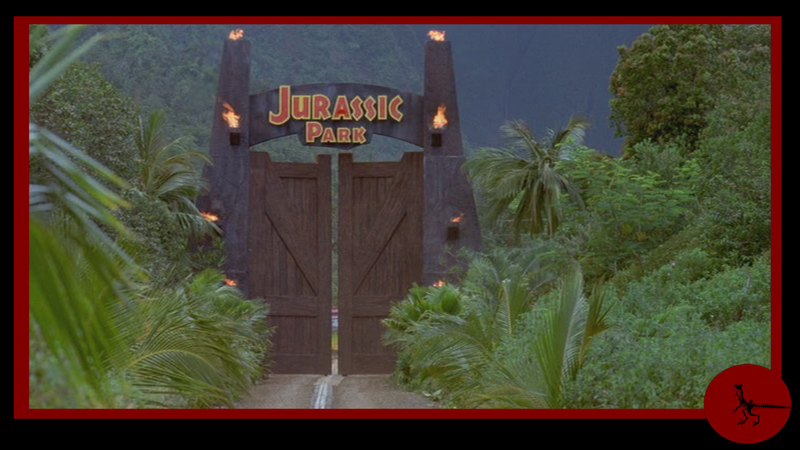 Welcome to Jurassic Park. Somehow this reminds me of an adventure movie like Conan the barbarian. It must be the torches. 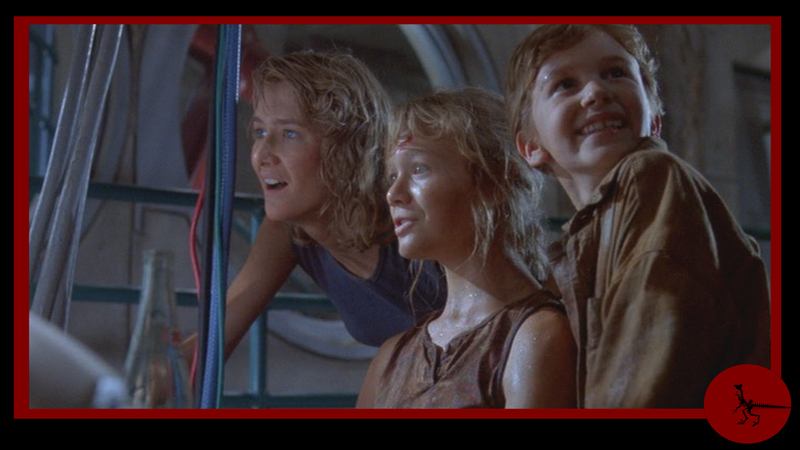 A group of people made up out of scientists, a laywer and two kids, inspecting a theme park filled with living dinosaurs before it opens become the target of ravening dinosaurs when a disgruntled employee sabotages the security systems to steal dinosaur embryos. After a few encounters and deaths the group and the park owner escape by helicopter. 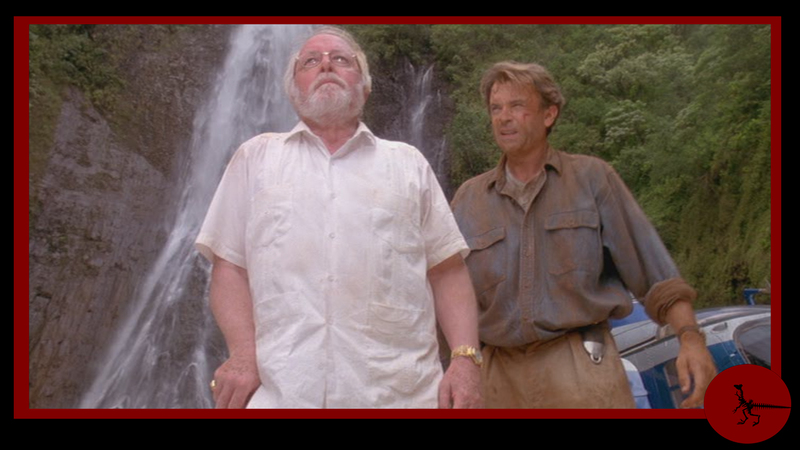 The story of Jurassic Park is about a rich old man named John Hammond who is the head of a bio-engineering firm and who made a theme park filled with living dinosaurs on an Island belonging to Costa Rica. 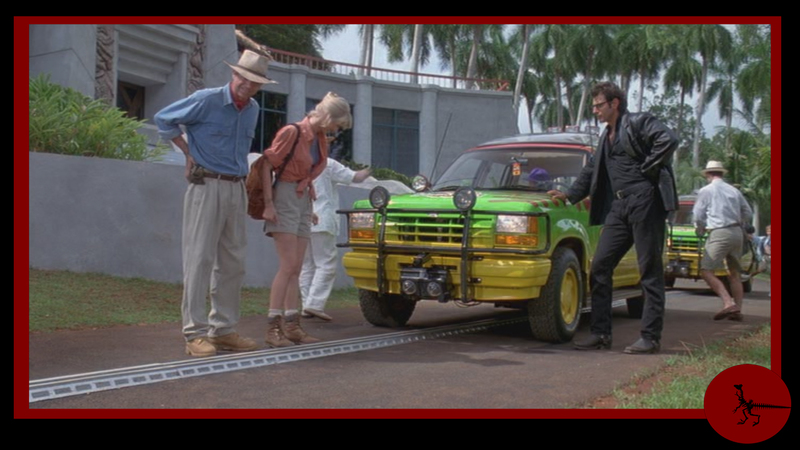 Before the park opens he invites a group of three scientists to inspect the park; the paleontologist Dr. Alan Grant, the paleobotanist Dr. Ellie Sattler and the mathematician Ian Malcolm. The scientists are joined by a lawyer representing some otherwise unnamed investors who are concerned about their investments after an employee has been attacked by a dinosaur. In addition they are joined by Hammond’s grandchildren Lex and Tim Murphy. The group gets a tour of the park during which they run into problems as the electrical touring cars fail. 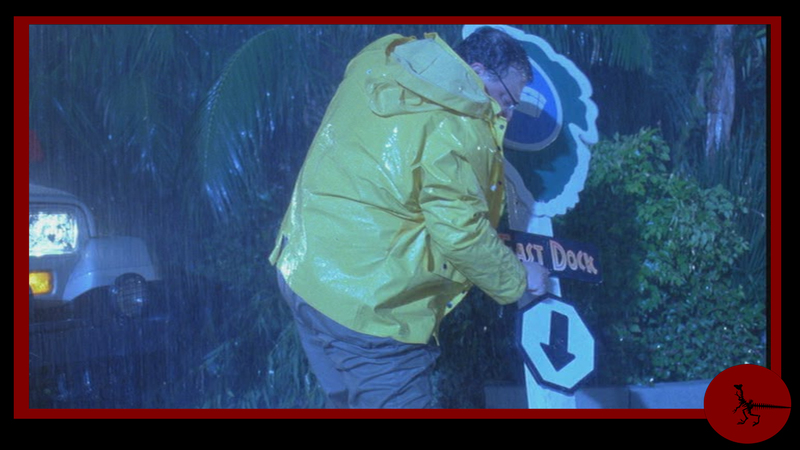 These problems become serious when Dennis Nedry, a disgruntled employee of Hammond, sabotages the security programs to steal dinosaur embryos and deactivates the electrical fencing that help keep the dinosaurs inside the park. In addition a storm approaches the theme park to make matters worse. 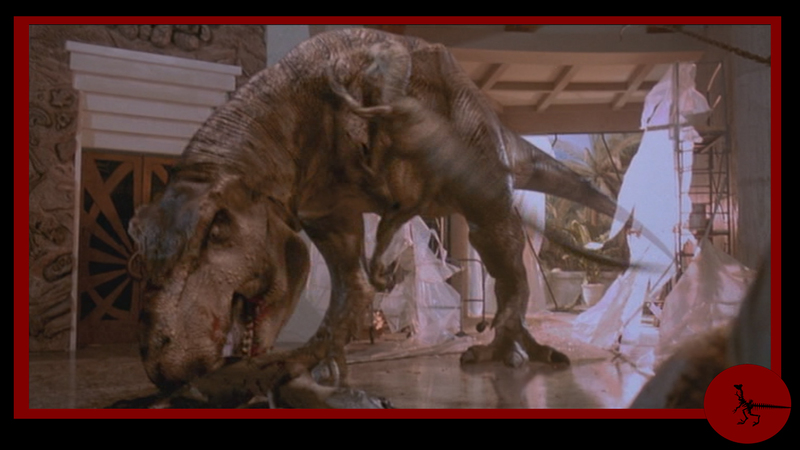 The group is attacked by a T-Rex that eats the lawyer and the group splits in two. 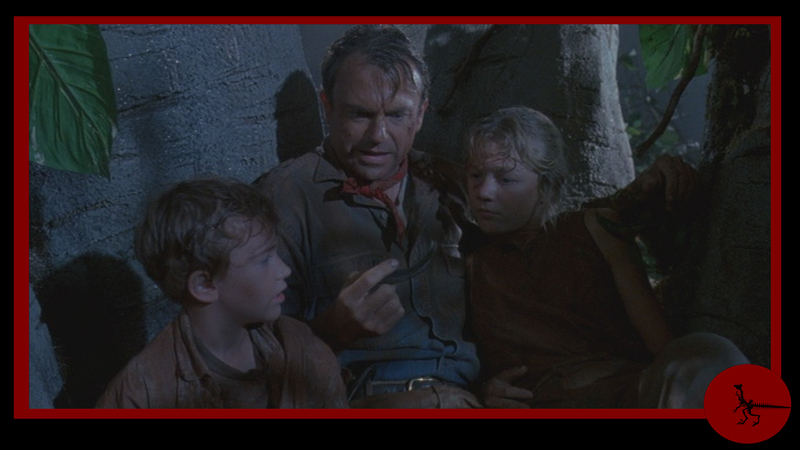 Grant and the two kids flee further into the park, while Sattler calls in the help of the head warden of the park, Robert Muldoon to help the now wounded Malcom. The three then reach the main building where Hammond and his chief engineer Ray Arnold are frantically trying to get security systems and fencing back online. 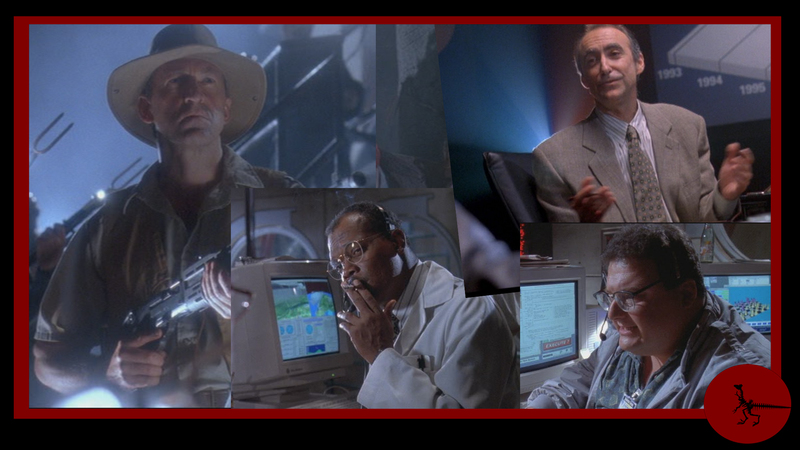 They discover that the computer running the software that controls the park is made inaccessible by Nedry, who is nowhere to be found as he tried to escape the park with the embryos, but got killed by a dinosaur. 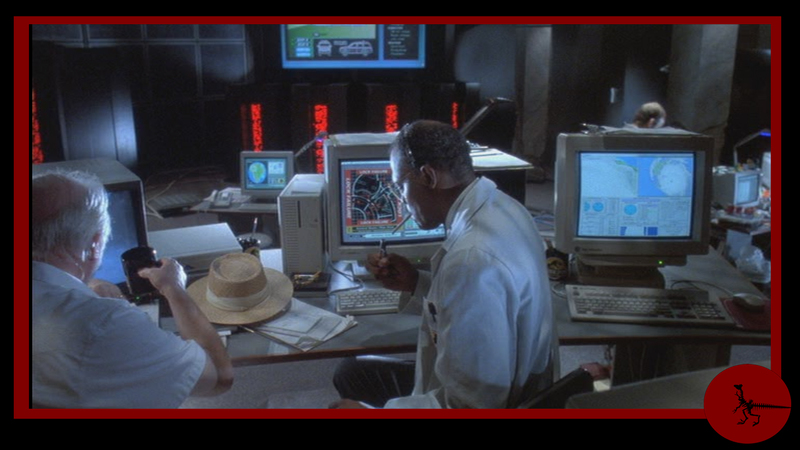 Hammond and Arnold decide that to restart all the systems to get them working again and gain access. 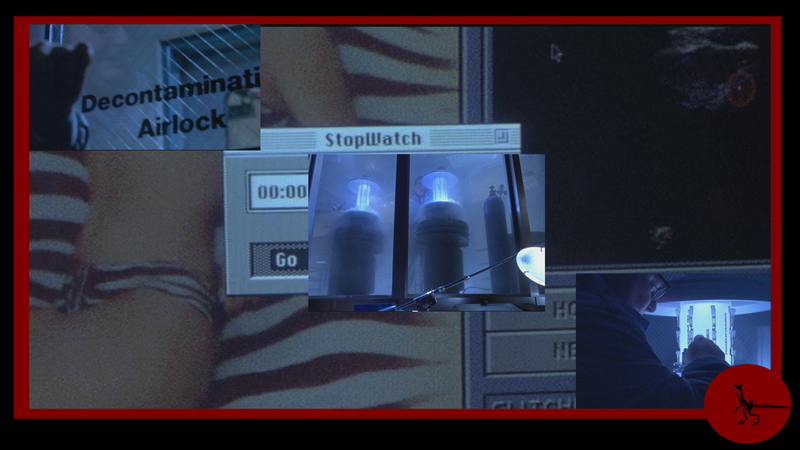 So they shutdown all systems, but to start them they have to throw some switches in a nearby underground bunker. 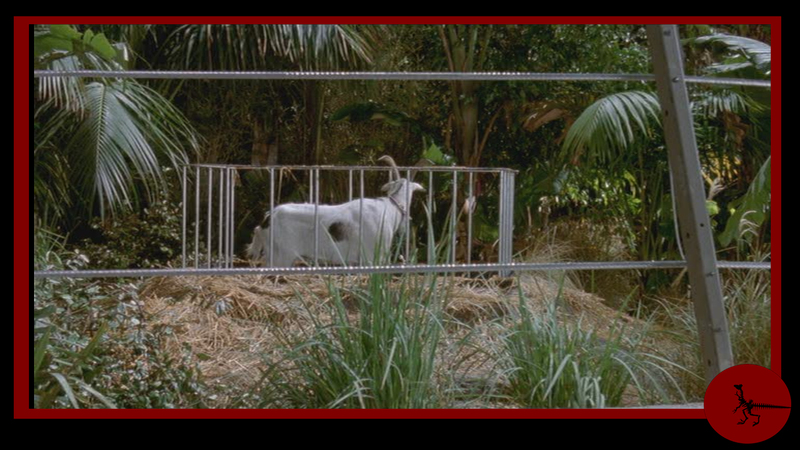 Arnold leaves for the bunker but disappears, so Dr. Sattle and Muldoon, leave for the bunker as well. When they reach the bunker raptors appear. 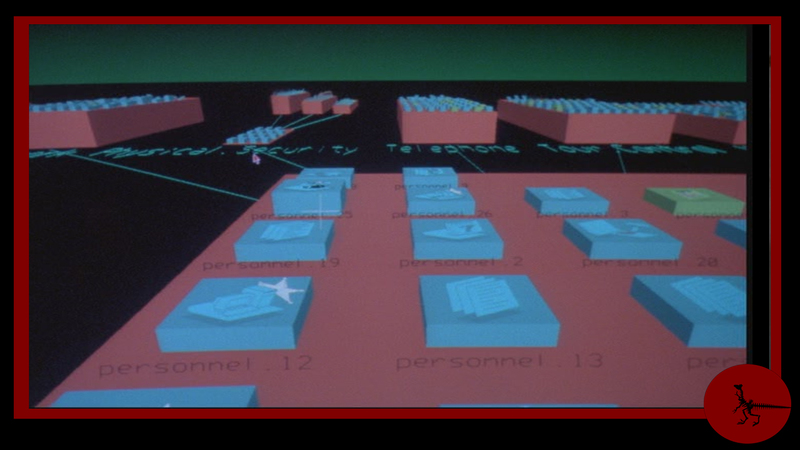 Muldoon fights them and is subsequently killed, gaining time for Sattler to enter the bunker to restart the systems. 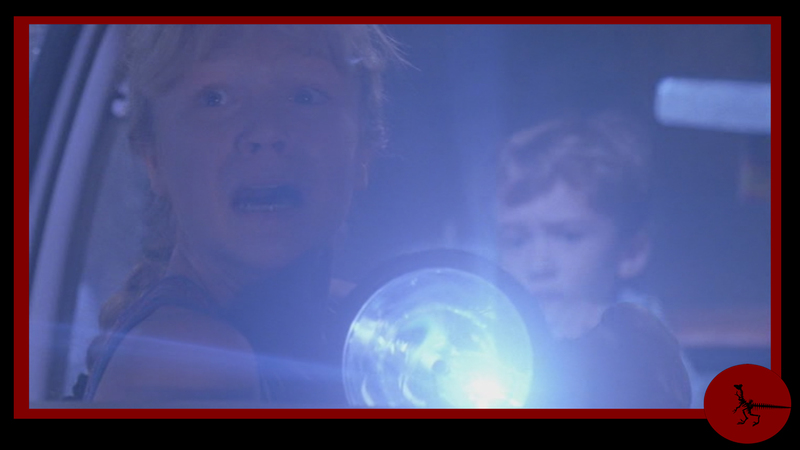 Sattler succeeds in doing so and then discovers that Arnold has been killed by a raptor that is inside the bunker. She manages to escape the bunker and returns to the main building. In the meantime Grant and the two children, Lex and Tim arrive at the main building after a stay in a tree and a trip through the park. Lex then uses the computer system to activate the parks systems and this allows them to call for help. 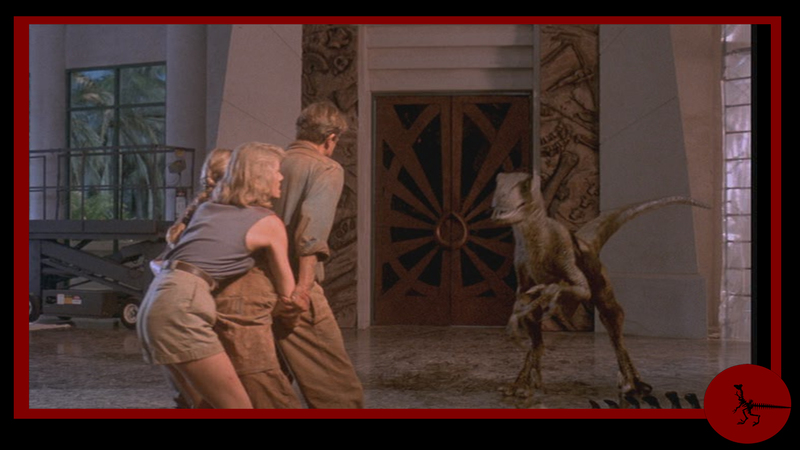 In the meantime a raptor appears in the main building and the group decides to make their way to the helicopter pad. Chased by raptors part of the group gets cornered by them in the central reception area, but they escape when a T-Rex attacks and eats the raptors. Everyone then leaves the island by helicopter. Stories are cut in parts that have a certain purpose. These parts follow each other in chronological order in which time usually follows a natural order. 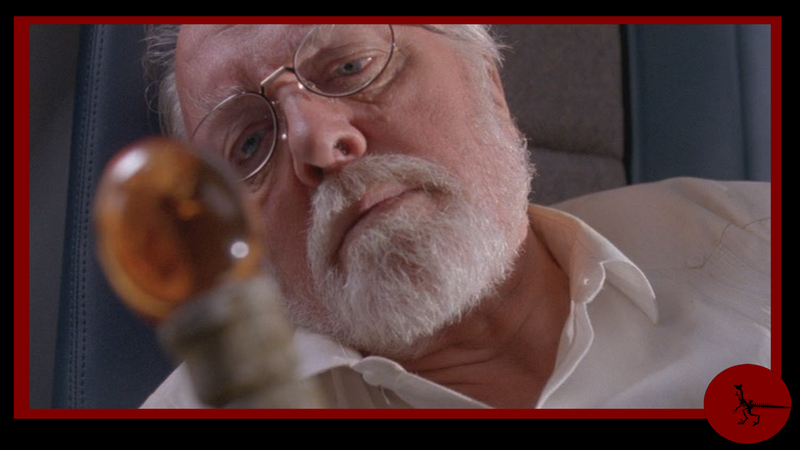 In Jurassic Park the story develops along a natural and predictable way. There are no jumps or flash back for instance. 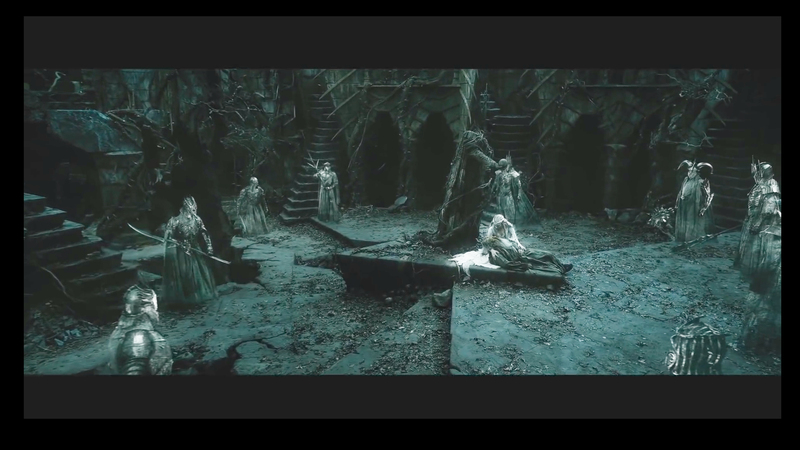 and time is not garbled up with things that occur later in the movie actually occuring earlier in the story. First there is a part in which the stage is set and we get introduced to the characters and some background. 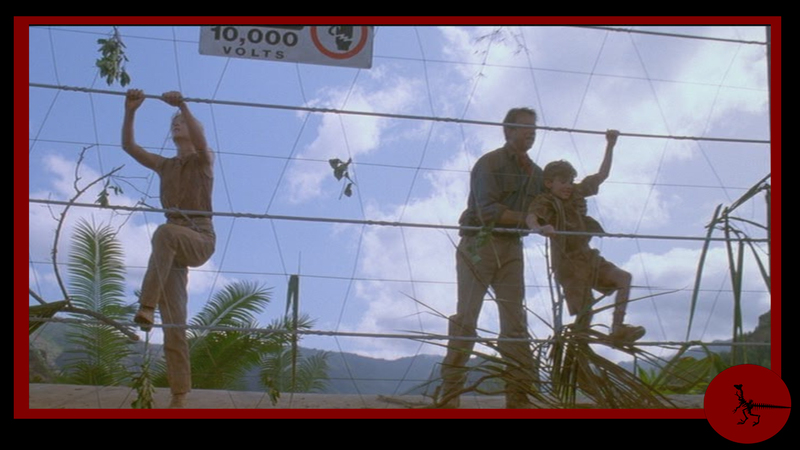 In Jurassic Park, this part is actually pretty long as it takes a whopping 35 minutes. 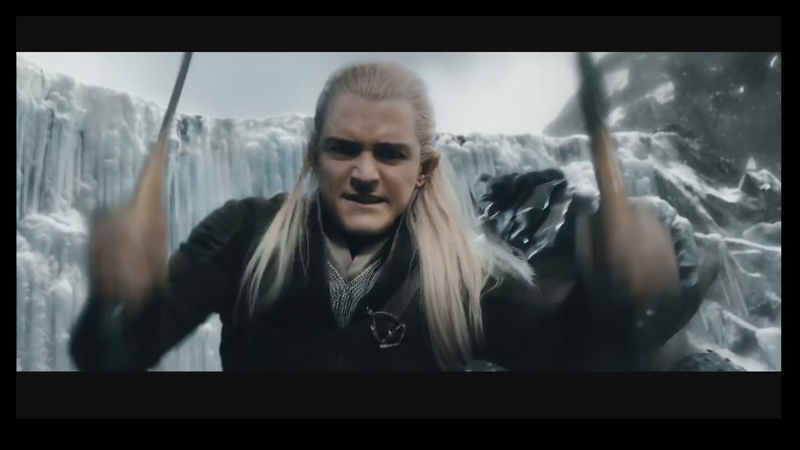 To keep us interested we get a few cliffhangers along the way. But first let’s first meet the main characters: Dr. Ellie Sattler and Dr. Alan Grant. We meet some other people along the way, including two kids, but in the movie the camera will follow these two. With an exception being made for the two kids at some moments. Grant will head out with the two kids and Sattler will team up with Malcom and other secondary characters. My eldest daughter said Ellie is the blond haired girl that is only good for getting into danger so she can be saved by men. I said she can’t be as she is a doctor and main character. It turned out that my daughter got it right. If you want to strip the story down to essentials then it’s Grant who is the main character as he is the only one who has a story arc of sorts in the movie and he actually develops(he is learns to deal with kids!) 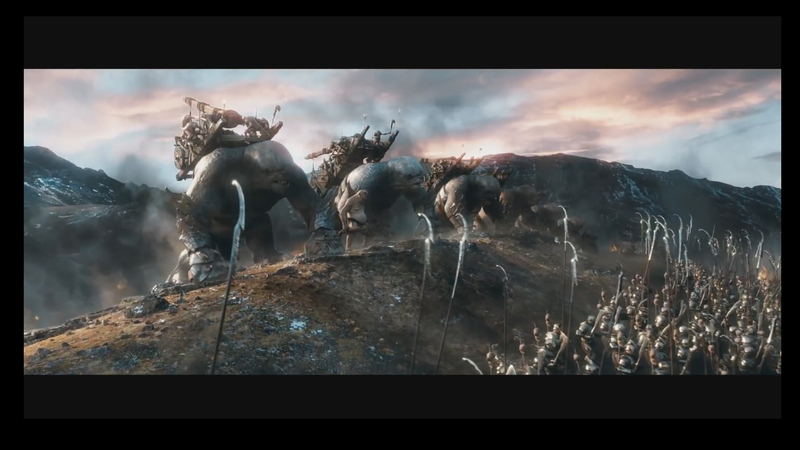 Non of the other characters have any kind of arc and some are just in the movie to get eaten. 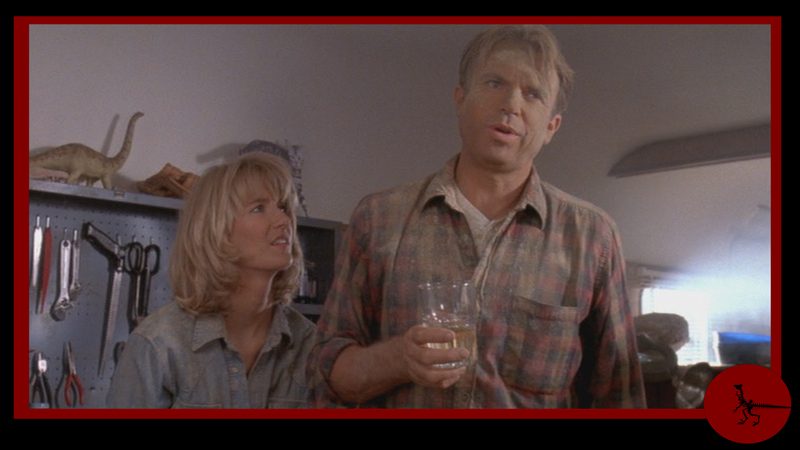 Dr. Ellie Sattler and Dr. Alan Grant in a rare shot: they are dirty. Alan and Ellie have a platonic relationship. Not surprising as he is drinking champagne from an oversized beerglass. I wonder what the tools on the wand behind Ellie are for. Guess they must be part of the standard equipment for Paleontologists. The other two important characters in the movie are god and the devil. It’s Hammond vs Malcolm as Malcolm, dressed appropriately in black, directs criticism against the creator of life Hammond(dressed in white) for meddling with nature and predicts he will be unable to control of his creation. It’s humans playing for god. It is science vs nature. And most of all: it’s a storytelling device to set the mood for what is about to happen. It will go wrong.. I tell ya! It will! Beyond these roles they don’t have much more to add to the story. Hammond is the creator who witnesses his creation going wrong and we get a kind of wrap up into the end of the movie where he and Ellie discuss the failure. 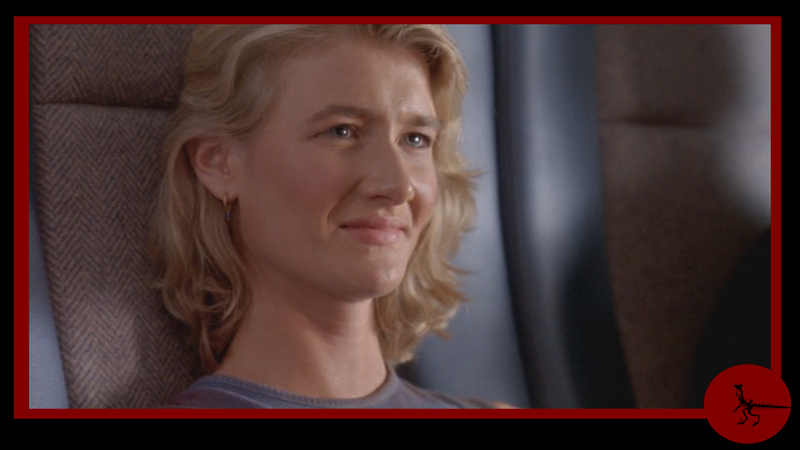 Malcolm flirts with Ellie Sattler for short period in the movie but then is out of the story because he is wounded. Yeah, he doesn’t get eaten. The creator and his critic. God vs the devil. Science vs the nature. Capitalism vs nature. Doom! Doom! And then there are kids who are there to get threatened so an Grant can save them and bond with them as a surrogate father. Grant bonding with the kids. Up you go, Laddie. And by the way: that fence is dangerous, that is why they put up a sign. So you know: it’s dangerous. More bonding. 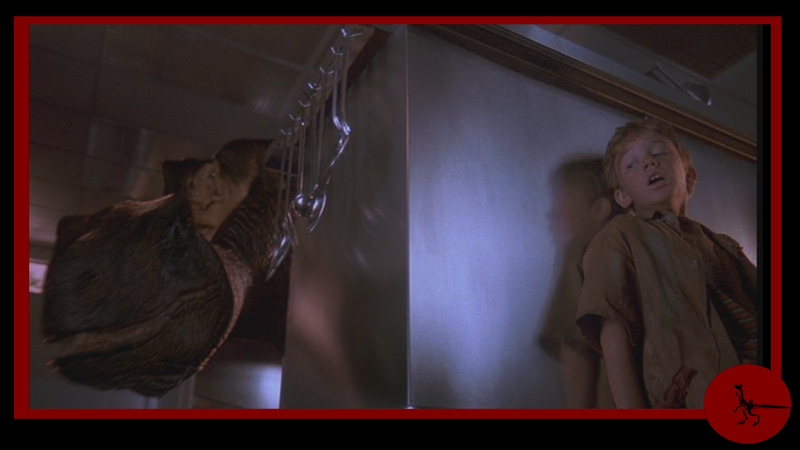 Kids aren’t so bad after all as compared to a ravening bloodcrazed T-Rex. And then there are the people who are meant to be eaten. The lawyer with dubious morals, the thieving nerd, the chain smoking black guy and the courageous but ineffectual park warden. 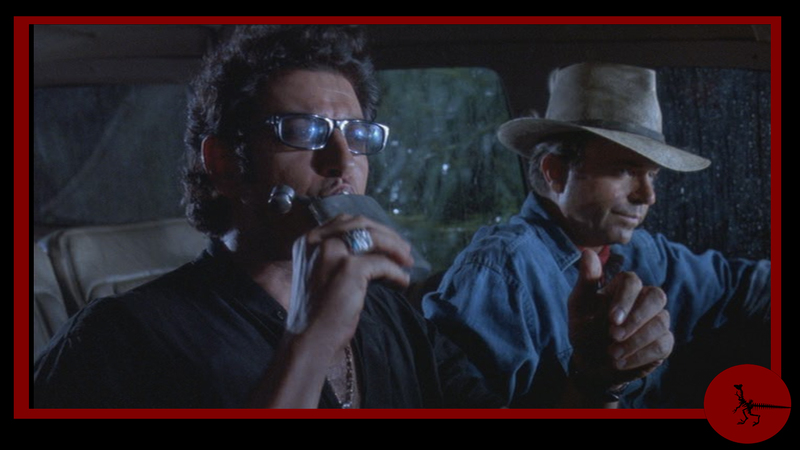 They even got names in Jurassic park, but no personality. They are just lunch. And of course to give us the feeling that there is danger. For without someone getting killed or eaten we wouldn’t think the main characters are in any danger. The very first thing we see is the attack on the employee. This establishes various things. 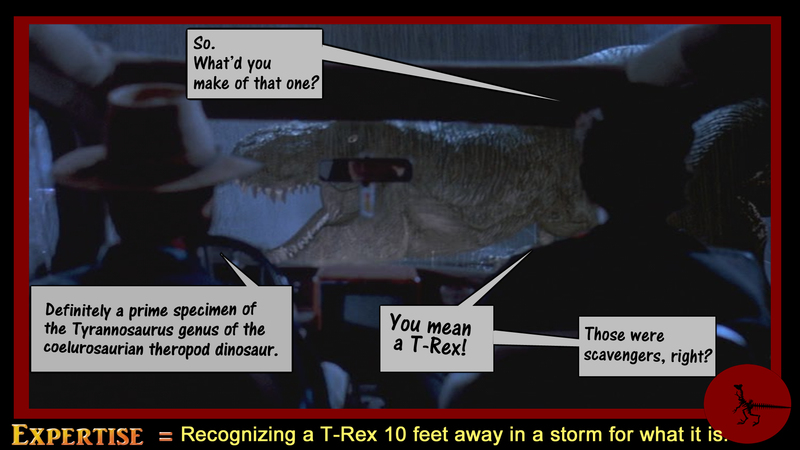 It alerts us to the danger involved: some dinosaurs are dangerous animals you know. It immediately grabs our attention. 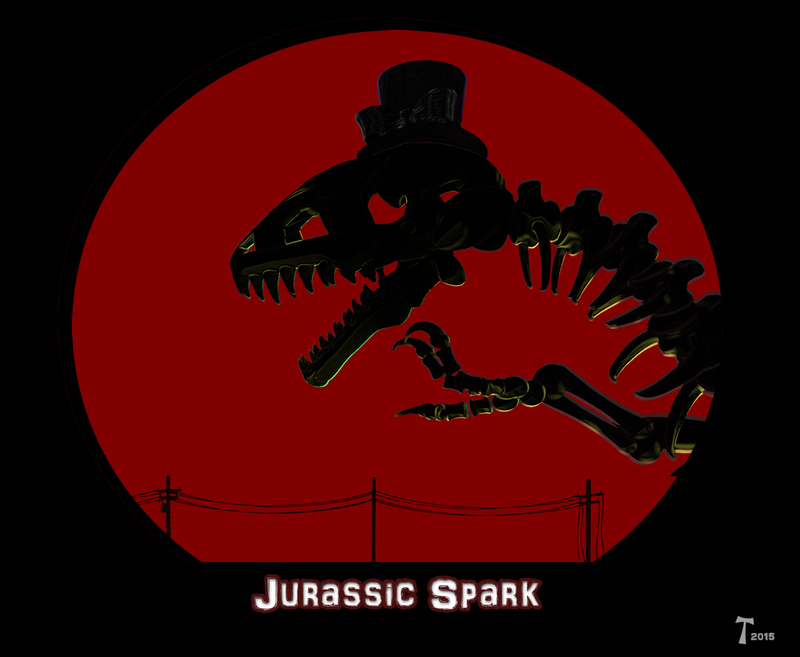 It gives a reason for the lawyer to be there and it is one of the reasons for the main characters to be there: Grant is invited partly to condone the park. The movie starts with things going wrong. An employee gets attacked by a dinosaur. 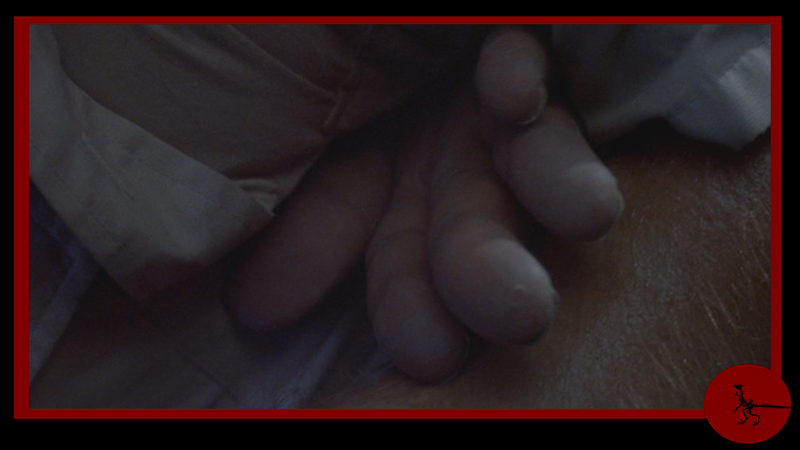 You get this symbolic shot of a hand slipping away from someone’s grasp because this is a PG movie. The blood and violence is kept to the minimum, so even I can watch it. 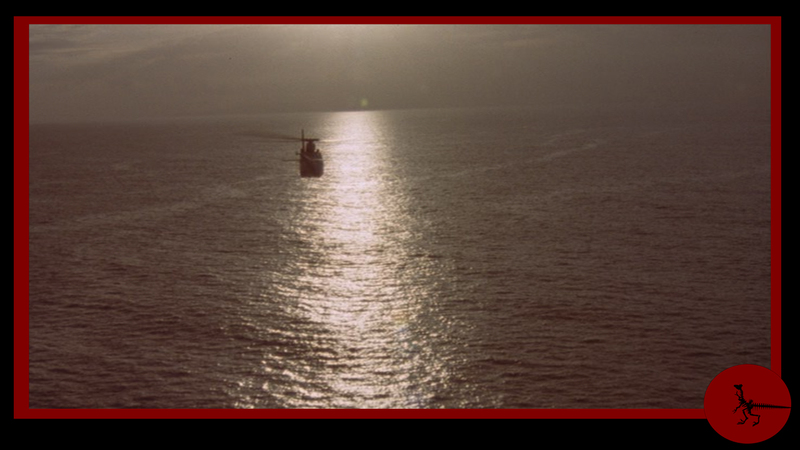 The second cliffhanger is about fifteen minutes into the movie. 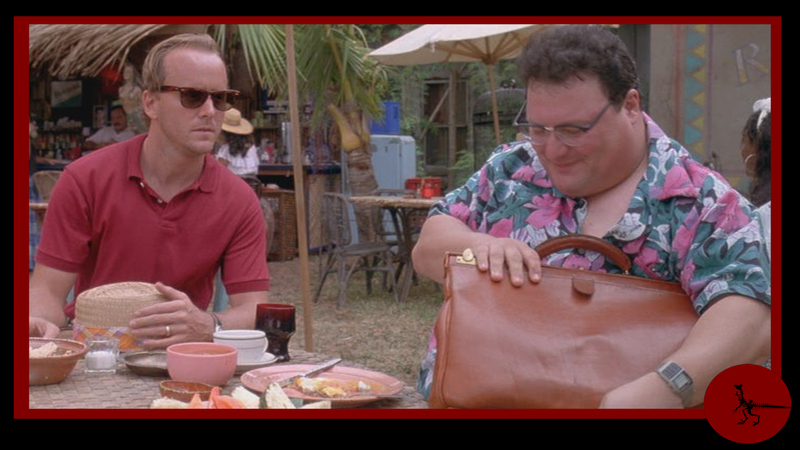 Here we witness Nedry making a deal with an representative of a competing firm to steal some embryos from Hammond. 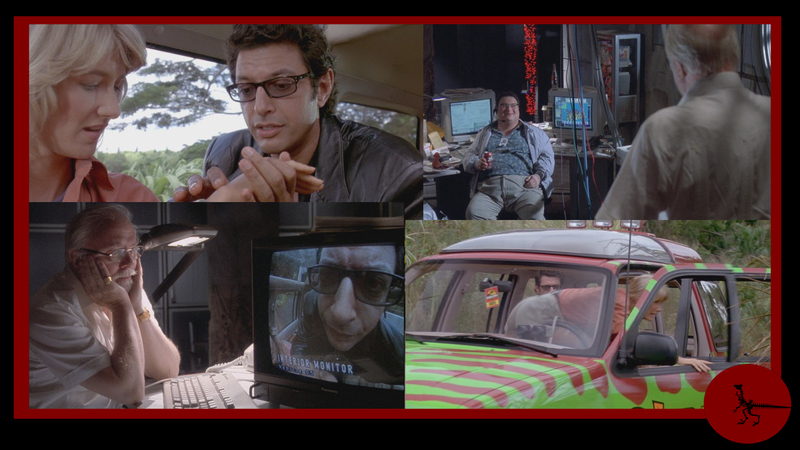 Nedry will be instrumental to the chaos of the latter part of the movie. His is a computer nerd and he is heavy build because computer nerds live in attics eating junk food and drinking coke. An unhealthy mind creates an unhealthy body. Or is it the other way around? We get to the characters somewhat later. Making the deal. The heavy set bloke is the computer nerd who is going to steal some dinosaur embryos for the guy on the left. Dirty deals are made in bars(preferably shady ones).We are about 15 minutes into the movie. The third moment is not a cliffhanger, but more to shake us up a bit. A cow gets lifted into the park and is eaten by a dinosaur. Since the movie is PG we are spared the bloody bits and we see just some plants shake and hear shrieks. It’s not very scary. They also no doubt wanted to delay showing the monster. Not showing monsters is a very good practice. Only I felt a bit sorry for the cow. We learn from this part that Spielberg has a sadistic streak in him. 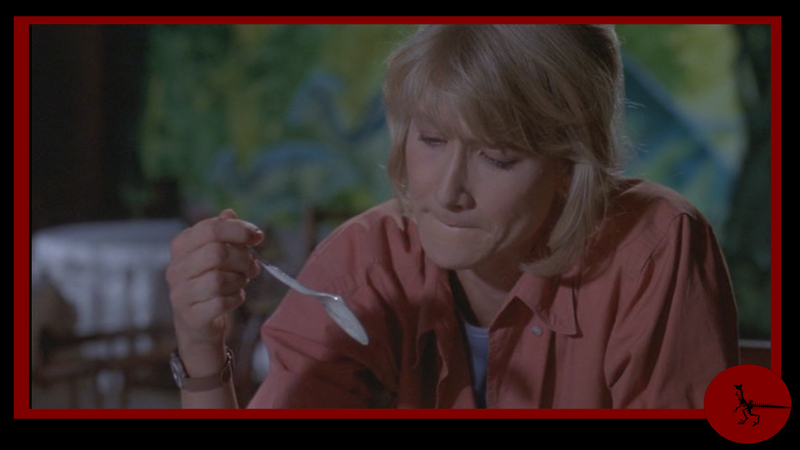 Or do meat-eating dinosaurs only feed on live animals? Tsh. Choosy buggers. A cow meets its doom. Death to cows! We are 30 minutes into the movie. 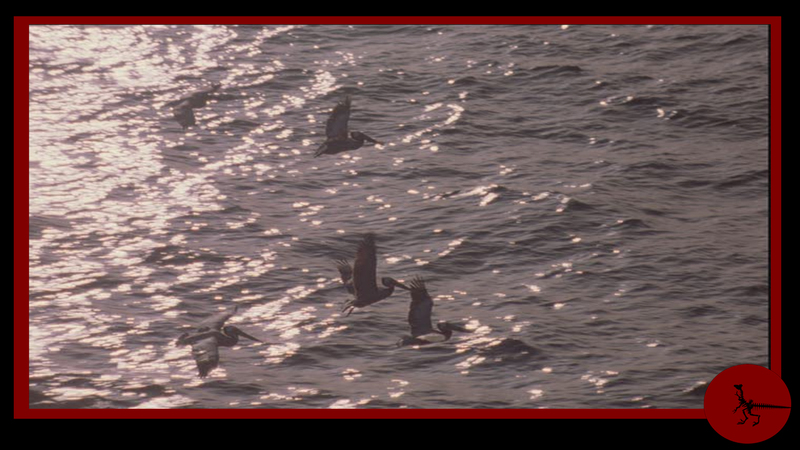 To keep us interested also during this part of the movie we are enticed with the possibility to see some dinosaurs. 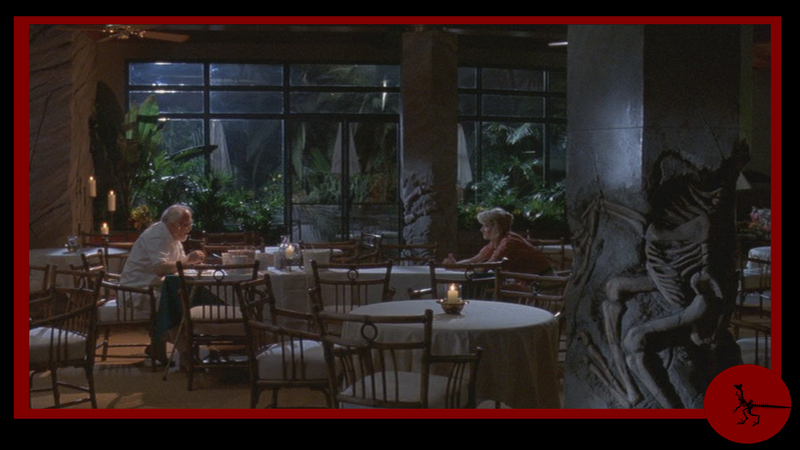 Surprisingly the first dinosaurs appear about twenty minutes into the movie and they are the only ones we see in the first part. 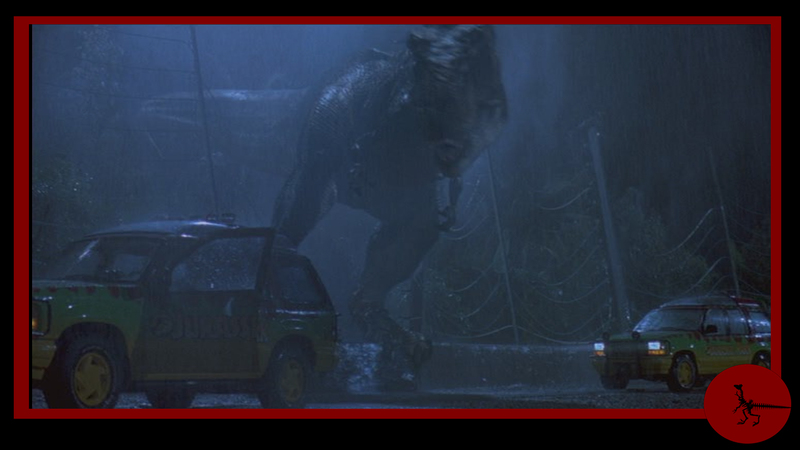 The first dinosaurs you see in the movie appear at 20 minutes into the movie. And that’s it for dinosaurs in the whole of the first part. 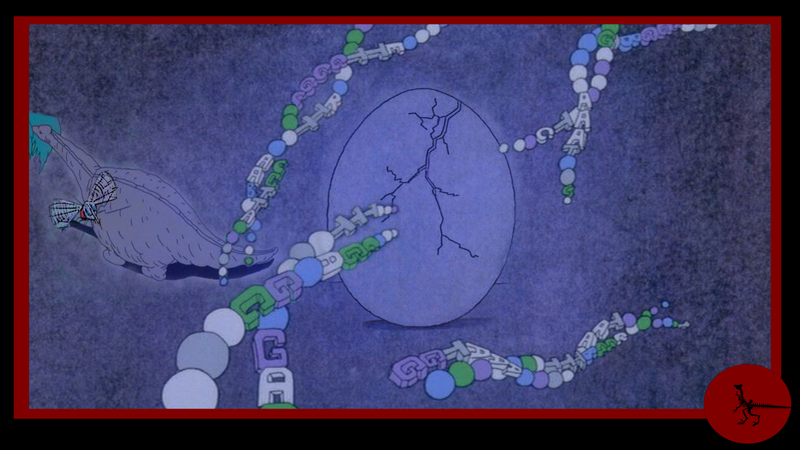 Well… not quite.. we see some dinosaurs being born in this scene that reminds me of Alien somehow. No face hugger jumps out of that egg though. 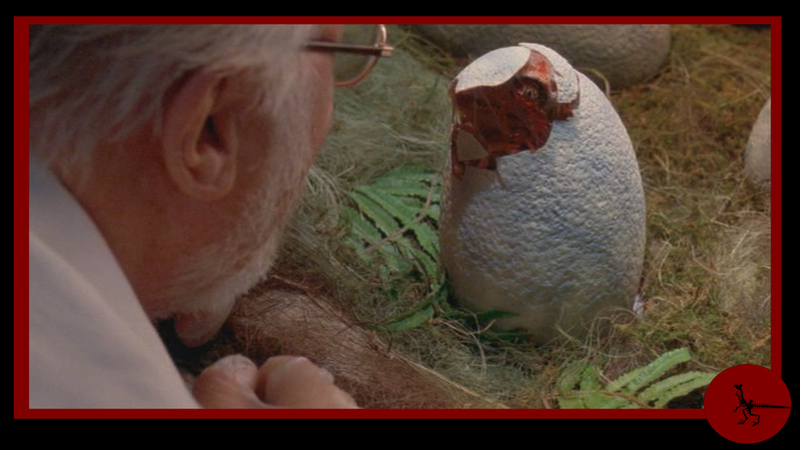 It’s a bird that hatches from an egg.. Eh.. a baby raptor. 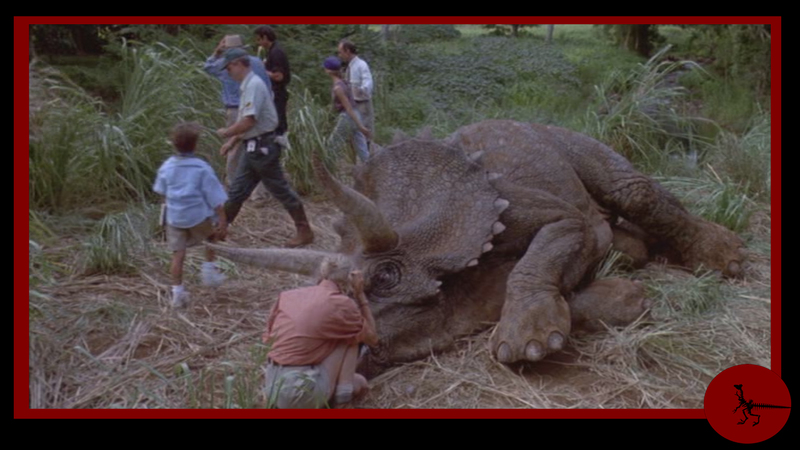 And some dinosaurs are being born about 25 minutes into the movie. The first thing you see in you live is the face of an bearded old man dressed in white. It is god! We have some other things occur in this part. 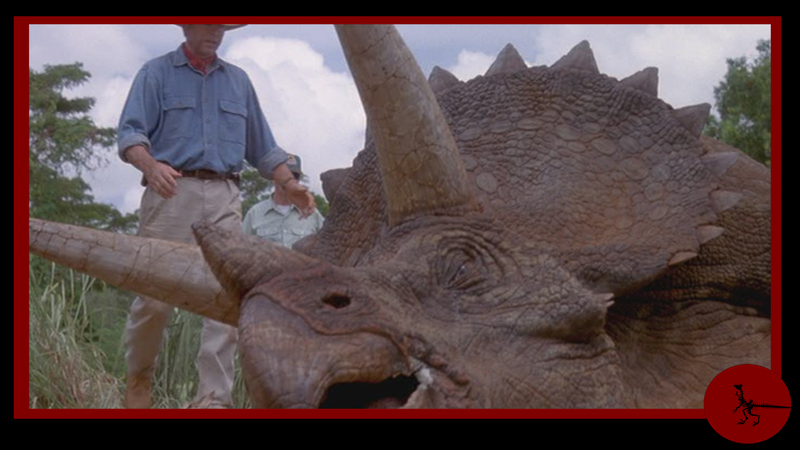 There is nice sequence about 20 minutes into the movie that explains how they created the dinosaurs. 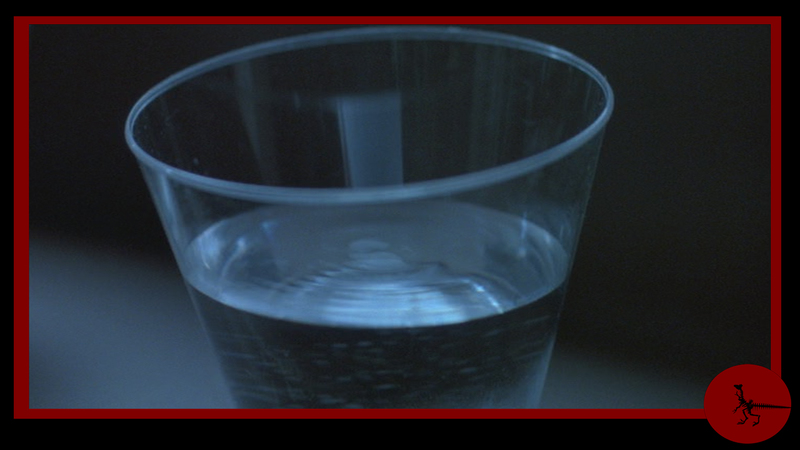 This bit is actually introduced quite smartly as it’s introduced in the story to the main characters as what is going to be presented to the visitors of the park, but it’s also meant for the watchers of the movie to understand a bit of the science behind the movie. 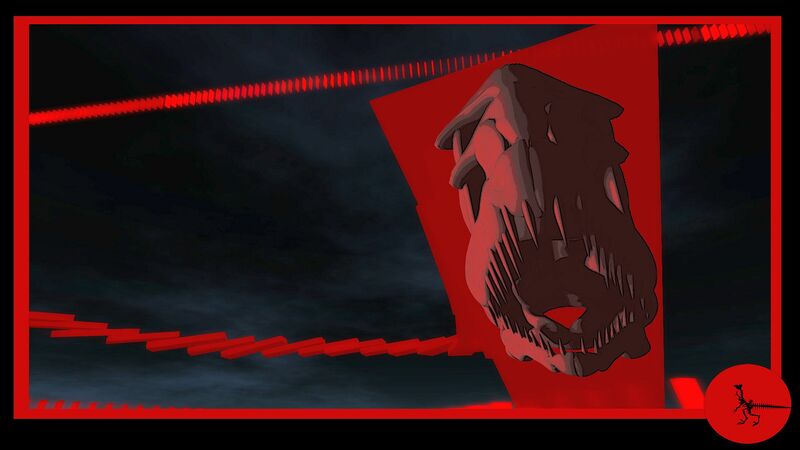 At 32 minutes into the movie there is the discussion between god and the devil which I mentioned earlier which is part of a bigger discussion about using science to create these dinosaurs. Grant and Sattler: you don’t know what might happen. 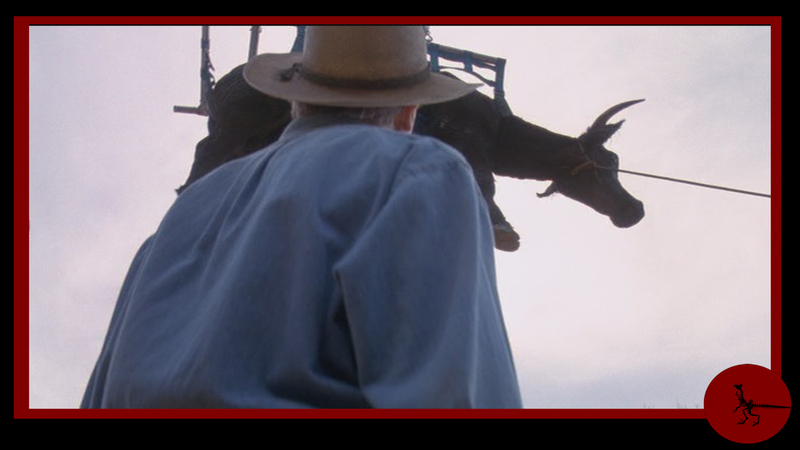 Malcom(the devil): it will go wrong. The lawyer: if there is a profit in it then do it. I found this attitude for a lawyer a bit strange as it seems to me that a lawyer is more concerned with lawerlike things and that profits are more the concern of business types. In fact a lawyer might as well be against it because of the judicial complexity this causes. Should humans meddle with that which god/nature destroyed? The second part starts about 35 minutes into the movie and last for about fifteen minutes. This is where the tour starts that will expose the the main characters to danger. Incidentally this is also the part where the children are introduced. If you were to cut of the whole first part from the movie you might still be able to follow the movie. 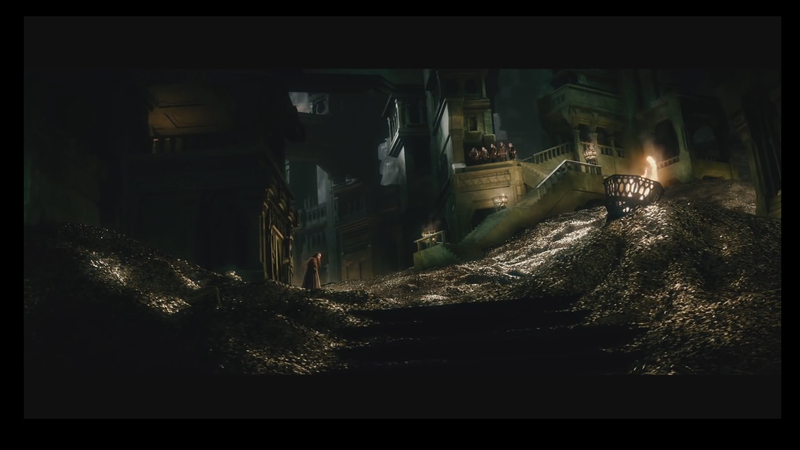 This part is therefore a lead up to danger: the start of the movie. In other words a second setup. The party gathers. 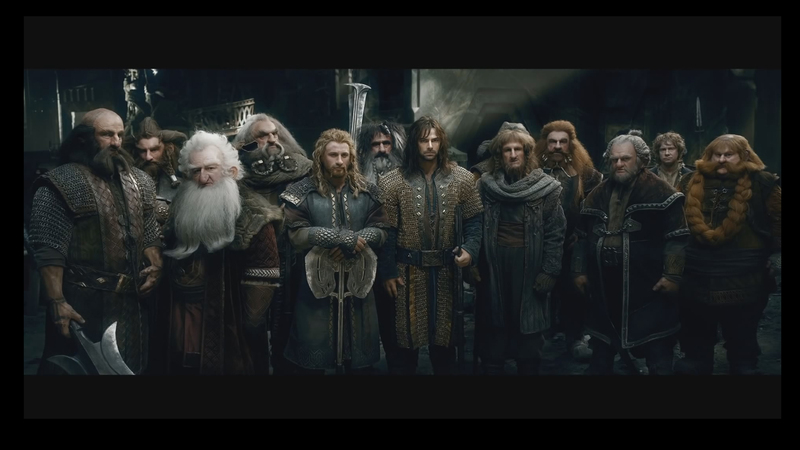 With hobbits, a wizard and a warrior.. wait, this isn’t Lord of the Rings so they are just normal people. Incidentally the cars are electrical and run along the track on the ground. Why? Because a horror gives you one thing, then takes it away. It is transportation that goes nowhere and certainly not to safety. 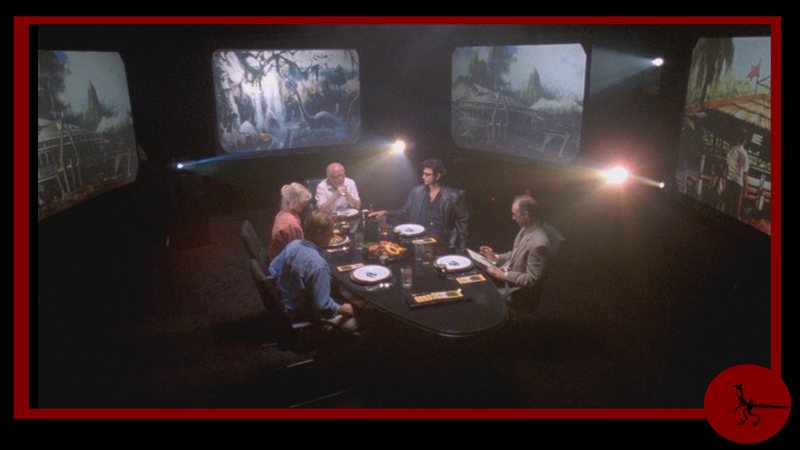 This part is mostly for setting up some interaction between the various characters as until now we have just been introduced to them and we have been enticed with the non show of dinosaurs. Time for some action. 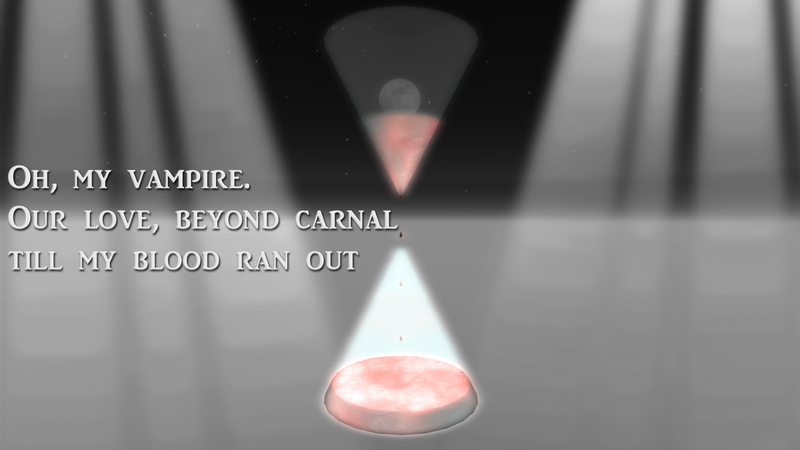 The pace of the story picks up as various things start to happen. Malcom flirts with Sattler. Hammond and Nedry get into an argument. Malcom makes some snide remarks in the camera that Hammond reacts to. And Grant leaves the car, dragging the rest along. 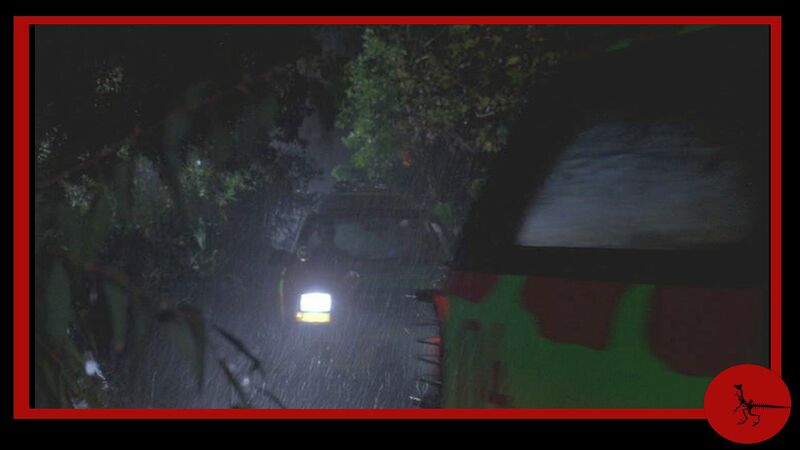 For some strange reason Sattler steps out of the car at the wrong side. I guess this might have something to do with the camera. Things get moving along faster now. Ian flirting with Sattler. Nedry and Hammond have an argument. If you didn’t know it yet: Nedry is the nerd who lives on coke. Do you see the coke in his hand? If you didn’t we can always throw in a closeup. Hammond(in white) is annoyed at Malcom’s(in black) remarks. It’s not for the first time. And Sattle leaves the car to follow Grant by exciting at the opposite end. Curious. The party gets out so we get to see the first dinosaur upclose . It’s a triceratops. Hurrah! But it is ill! 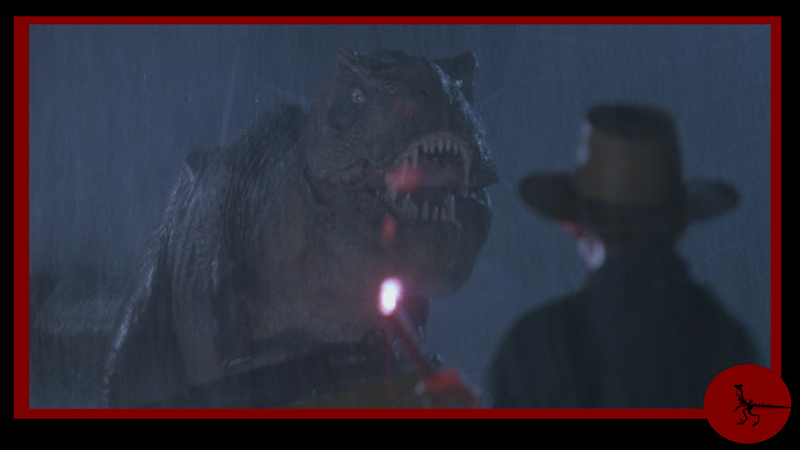 It is also the last time we get to see a dinosaur that close, except for a meeting with a brachiosaurus. And of course when people get eaten or attacked. A triceratops upclose. 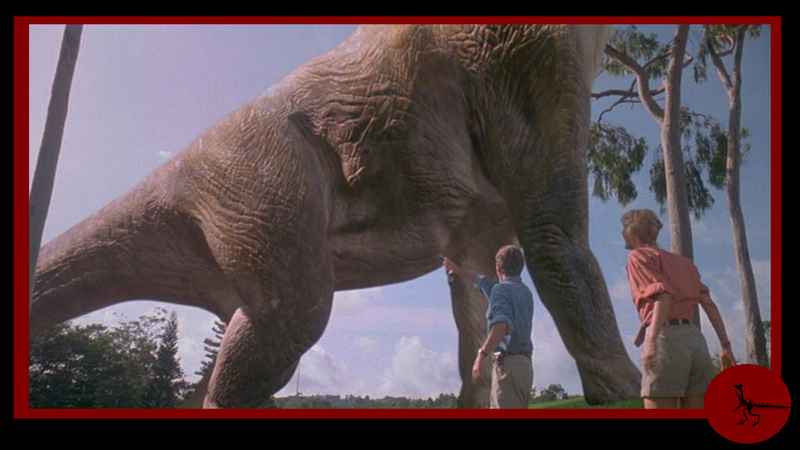 It’s the first time they get this close with a dinosaur in the movie and the last time except one incident with a brachiosaurus. Not counting when someone gets attacked or eaten of course. Then they are too close. It’s about 50 minutes into the movie and it’s time that things start to happen before people start to leave the theater.. Hence things happen: the nerd makes his move, the rain hits the park and the electrical fences and cars start to fail. Continued in the next post (as this post is long enough).